Great Golf may not feature any sort of polo shirt-wearing Mario look-a-like huffing from hole to hole, but the golf it delivers is, indeed, far greater. Pick from Tournament, Match Play, or Training mode on the menu screen. Training allows you to practice each hole separately before you play against other people. Tournament is an up-to-four-player mode (passing around controllers – no four-player adapter yet) where winner is determined through a series of matches. Match Play is two-player-only and will take you through all eighteen holes. In this mode, it doesn’t matter your total score at the end of the game. The way to win is to get a better score on more holes than your opponent. So even if your opponent’s final score is greater than yours, if you have a better score on ten holes as opposed to his better score on eight holes, you win. The modes are nothing special. Rather, it’s Great Golf‘s mechanics and style that give the game an edge over other golf titles of the day. When you start out on any mode, the camera scrolls around the entire hole, allowing you to visualize your shot prior to teeing off. When the camera finally rests, you see the ball and a bit of your surroundings from a 3/4 isometric viewpoint. You’re then given the ability to shuffle through clubs: irons, putters, wedges – the gang’s all here. Pick the appropriate club, line up your shot with the in-game cursor that you rotate with the D-pad, mind the wind direction, let the power meter rise to the appropriate power level, then press Button 2 for a perfect hit onto the fairway (or sand trap, as the case may be). Sanding it up. But look! Nice on! Everything about this system works flawlessly, particularly the easy-to-comprehend power meter. The more the power meter fills up, the more power you’ll have when you finally hit the ball. It’s so simple and effective that one would think every golf game during the mid-80s would have utilized a meter like this, but no. NES Golf‘s power meter forces you to time your button press just right in order to hit the white bars on the meter. Anything above or below the white bars and you will whiff your shot completely. Now, admittedly, Great Golf debuted about two years after Golf – more than enough time for Sega to hone and refine Nintendo’s wonky mechanics. Therein lies the difference, though. Even today, Great Golf is a solid representation of golf. Sure, it’s light on modes and it has no character or stat options, but this is to be expected given the time of release. 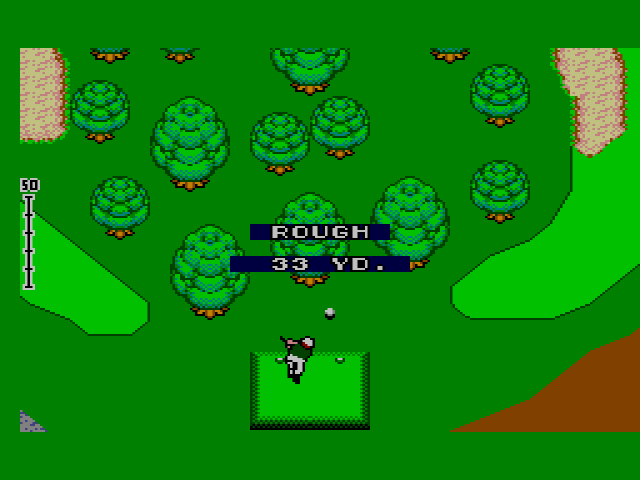 Golf – often held up as the pinnacle of mid-80s virtual golf – was more than acceptable for the time, but the game is clunky and crude now. Somebody get these trees out of the way! Early sports games live and die by their mechanics alone. Sharp graphics, decent controls, excess of game modes: these are all fine accoutrements, but if the sport being played doesn’t feel like a smooth, effortless experience, the developers have failed. Great Golf is not a masterpiece by any stretch, but it is a smooth, effortless round of 8-bit golf. Well done, Sega. 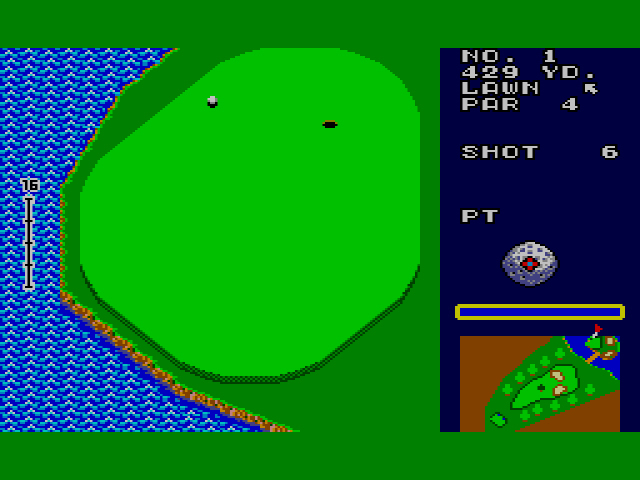 Those of you who have played a Great Golf for the Master System might be looking at these screenshots and saying, “Zuh? That doesn’t look familiar.” That’s because this iteration of Great Golf stayed in Japan. 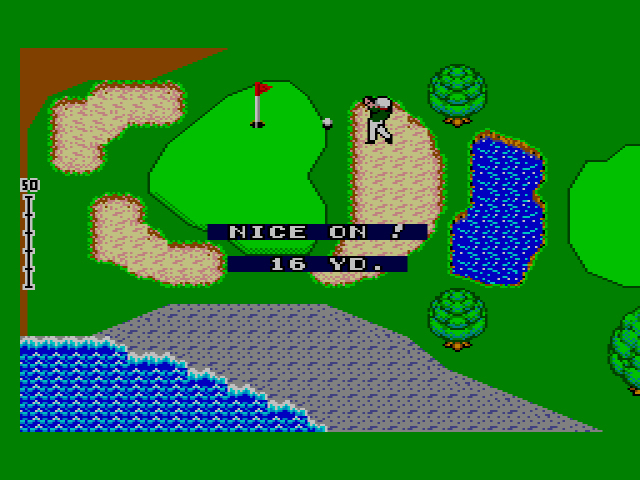 The version of Great Golf that you remember – the one that was released in the States and Europe – came out in 1987 and is a different game entirely.